Names are cultural as the personal is political for marginalized groups. Benjamin explained that the Jews of northern and eastern Europe historically practiced patronymic naming exclusively, naming children after their fathers, as in: Jacob, son of Isaac, son of Abraham. (The most famous contemporary patronymic society is Iceland, although they sometimes use matronyms now, too.) It was only with the bureaucratization of modern citizenship in eighteenth and nineteenth century Austria, Prussia, Russia, France, and Bavaria, that Jews were forced to take permanent surnames, and these were often not of their choosing, based things like on places, occupations, or even insults. Besides being generally dehumanizing, this system of Jewish surnames also eventually made it easy to round Jews up for the Holocaust (see the Kaplan and Bernays’ The Language of Names, and this paper, for some history). An exception, incidentally, is the use of the priestly honorific terms Cohen and Levy, which were already in place (e.g., Philip, son of Marshall the Cohen) and then became permanent surnames. I assume Israeli politicians aren’t ditching the name Cohen for something more Hebrew sounding. Today it’s probably safe to say most Jewish children in the U.S. don’t have Jewish first names per se (although they sometimes have a Hebrew name they use just for religious occasions). 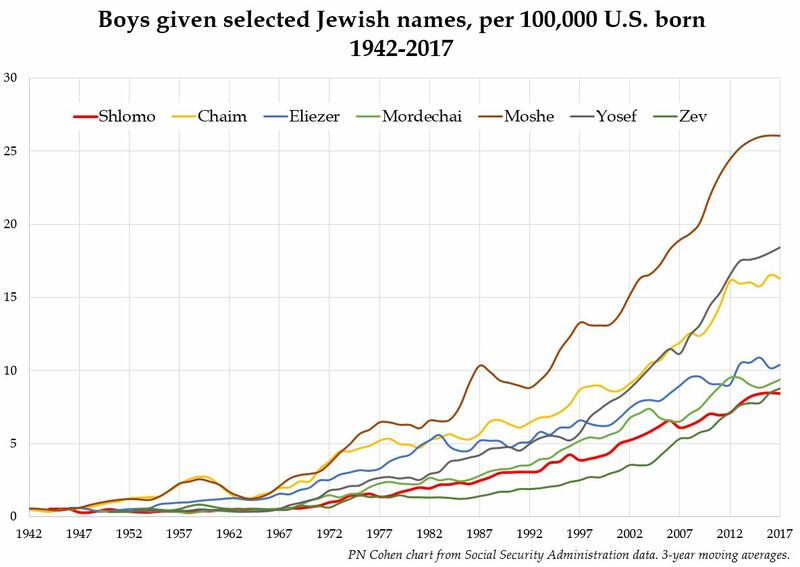 Here I look at the trends for seven Jewish boys’ names I found on various naming websites: Shlomo, Chaim, Eliezer, Mordechai, Moshe, Yosef, and Zev. These were the most popular ones I could think of (feel free to suggest others). First a little data on Yiddish and Hebrew in America. This is all from the Decennial Census and then, after 2000, the American Community Survey, which asked about “mother tongue” (language spoken at home as a child) from 1910 to 1970 (except 1950), and language spoken at home after that. The Census doesn’t ask about religion. Yiddish was the language spoken by the big wave of Jewish immigrants in the early twentieth century. Hebrew is the primary official language of Israel, and the religious language of Judaism. This shows the percentage of people in the U.S. who spoke Yiddish or Hebrew from 1910 to 2017. * The peak in 1930 is 1.1 percent, during the immigration boom. The 1970 peak reflects the only year “mother tongue” was asked of non-immigrants as well as immigrants. By 1980 only one-in-500 Americans spoke Yiddish or Hebrew at home. The second thing about Yiddish and Hebrew is children. There are a declining number of old immigrants speaking Yiddish, and no new immigrants speaking Yiddish. So most people speaking Yiddish as their language today are probably the descendants of those immigrants, orthodox Jews participating in ethnic revival or preservation. The same goes for people speaking Hebrew at home, except by now some of these could be immigrants from Israel and their children. (By 2000 Hebrew speakers outnumbered those speaking Yiddish.) 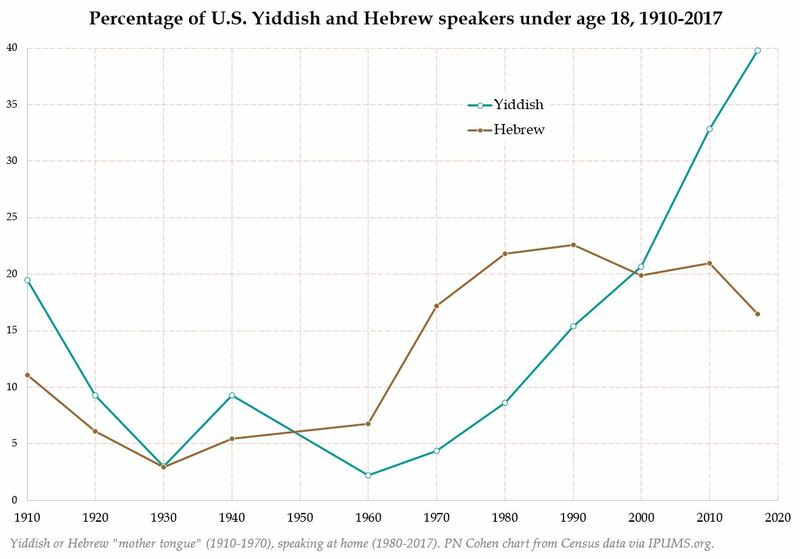 Here’s the percentage of Yiddish and Hebrew speakers that were under 18 for the same years. It was low in 1930, when they were mostly working-age immigrants, and then in 1960 when their kids were grown. The percentage under age 18 increased after 1960, and now 40 percent of Yiddish speakers are children (which is not the case for Hebrew). 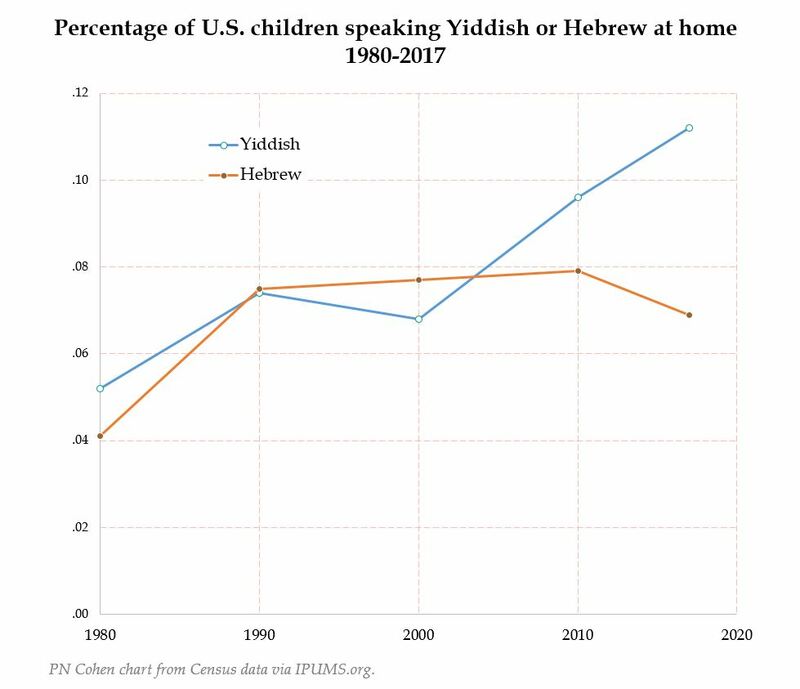 And, this is key: the proportion of all U.S. children speaking Yiddish at home has more than doubled since 1980, from 5 to 11 per 10,000. If these numbers are to be believed. The sample numbers here are small, but the ACS sample is also picking up about 150 Yiddish or Hebrew speaking women per year having babies, which implies that population is having about 10,000 babies per year, or about 26 out of every 10,000 babies born in the country. So, who’s naming their sons Shlomo, Chaim, Eliezer, Mordechai, Moshe, Yosef, and Zev? Now switching to the Social Security names database, I find that these names together accounted for 1,943 boys born in 2017 (that’s 9.9 out of every 10,000 US boys born). What’s interesting is that none of these boys’ names reached the threshold for reporting in the database — five children — until 1942. This is remarkable given that Yiddish was in decline by then. And they’ve all been growing more common since that time. So all those Yiddish immigrants in 1920 weren’t naming their sons Moshe, or at least not legally, but now a growing (though small) proportion of their descendants are. I can’t tell if Yiddish or Hebrew speakers are giving their sons these names. 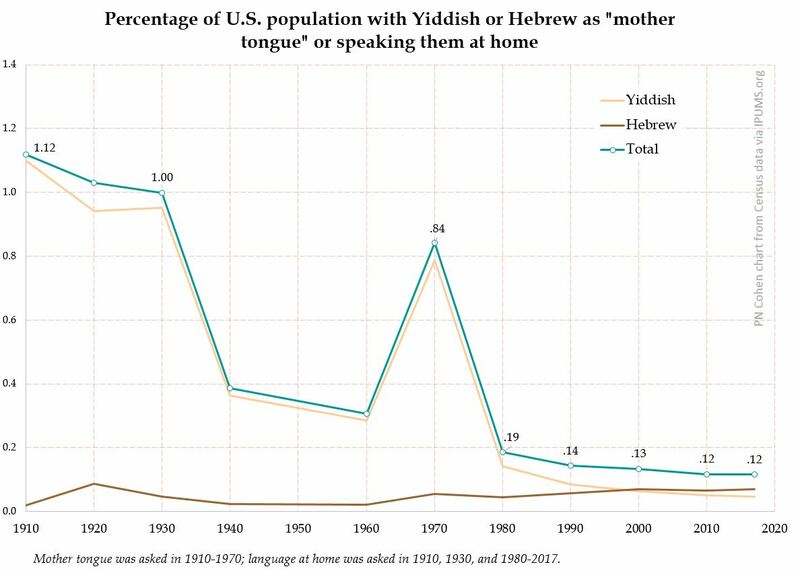 But there must be some connection between the rise of these names and the increase in the proportion of children speaking Yiddish at home. It might not be same people teaching their kids Yiddish, but they may be part of the same (highly localized) revival. I’ve put the Social Security names data, and my SAS code for extracting name trends, on the Open Science Framework here. * An earlier version had much higher prevalence of Yiddish and Hebrew before 1980 because I was accidentally just showing the percentages among immigrants. 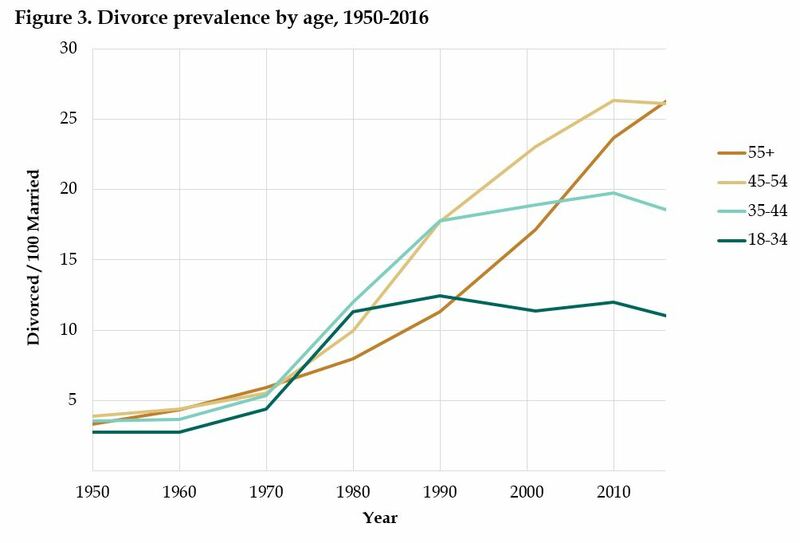 After this post about small multiple graphs, and partly inspired by two news reports I was interviewed for — this Salt Lake Tribune story about teen marriage, and this New York Times report mapping age at first birth — I made some historical data figures. An important, simple way of illustrating the myth-making around the 1950s is with marriage age. Contrary to the myth that the 1950s was “traditional,” a long data series show the period to be unique. 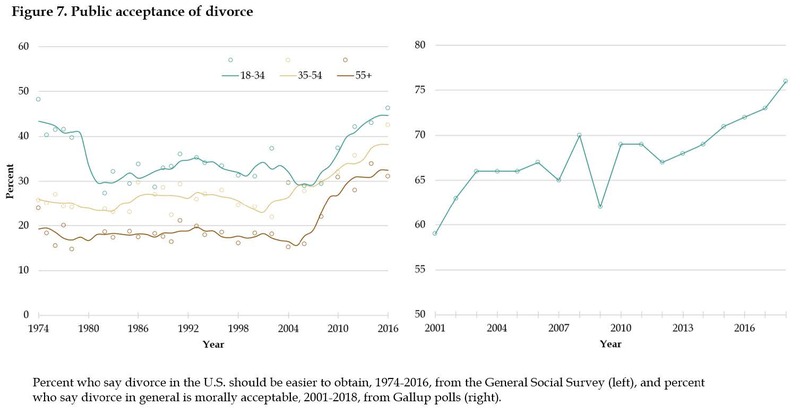 The two trends here, teen marriage and divorce, both show the modernization of family life, with increasing individual self-determination and less restricted family choices for women. First, I show the proportion of teenage women married in each state, for each decade from 1900 to 2016. 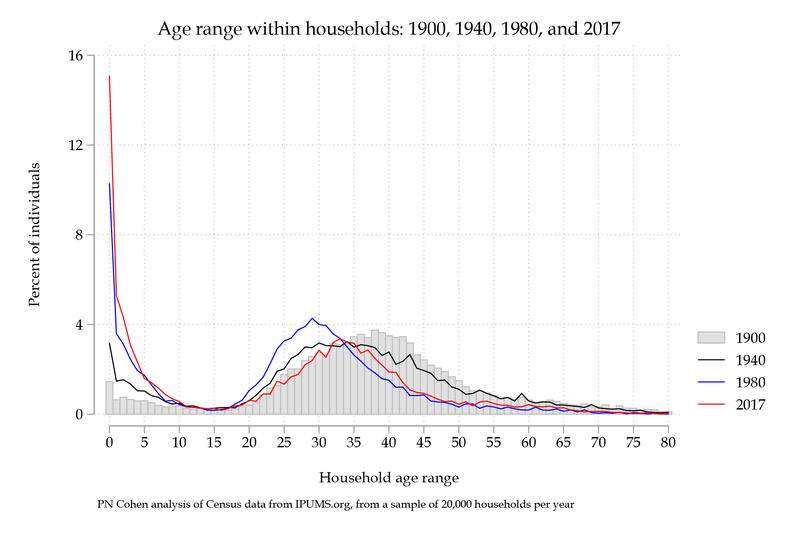 The measure I used for this is the proportion of 19- and 20-year-olds who have ever been married (that is, including those married, divorced, and widowed). 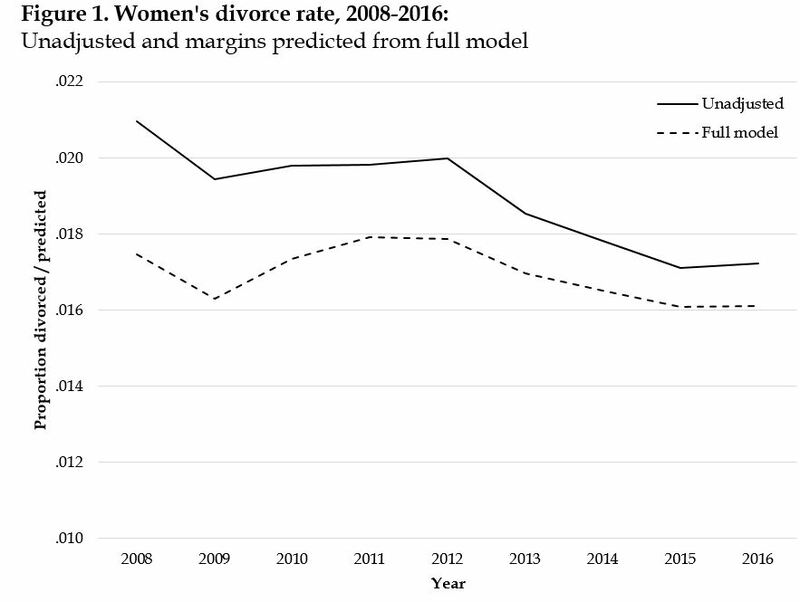 It’s impossible to tell exactly how many people were married before their 20th birthday, which would be a technical definition of teen marriage, but the average of 19 and 20 should do it, since it includes some people are on the first day of their 19th year, and some people are on the last day of their 20th, for an average close to exact age 20. Neither the small multiples nor the bars help you see the regional patterns and variations. So here’s an animated map that shows both the scale of change and the pattern of variation. 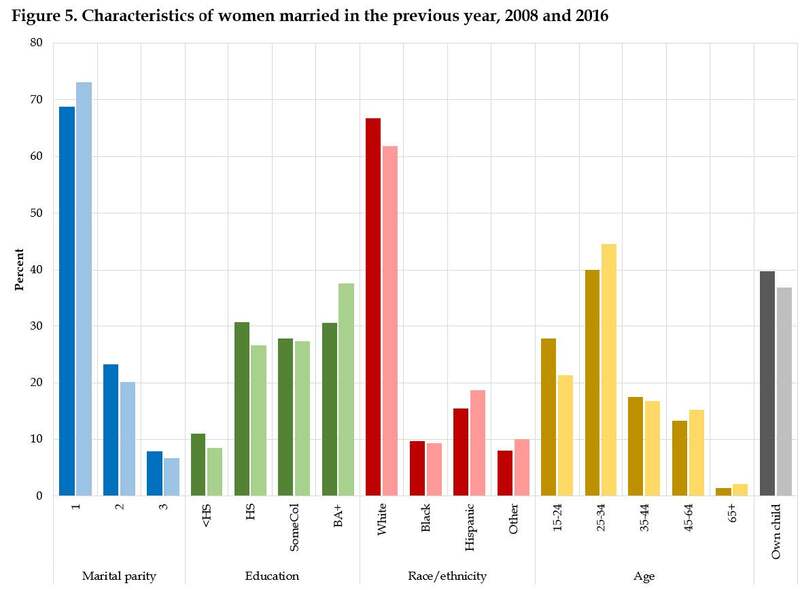 This makes clear the stark South/non-South divide, and how the Northeast led the decline in early marriage. 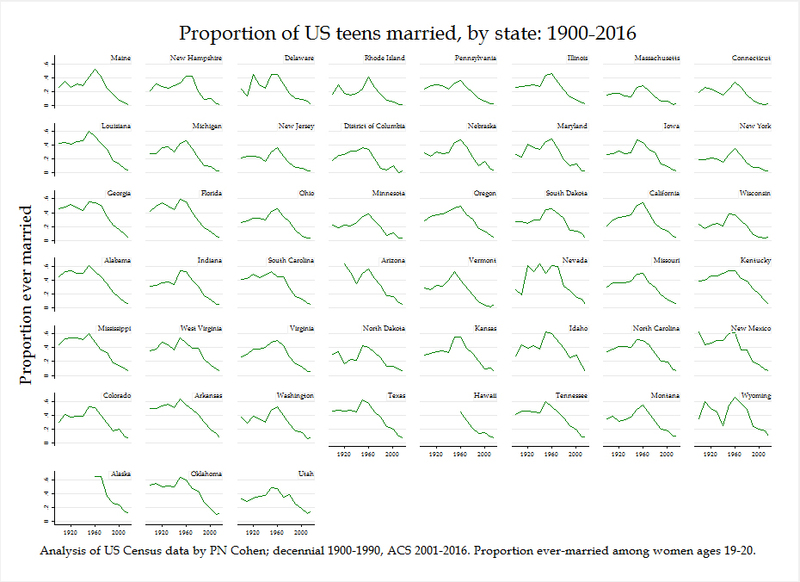 Also, you can see that Utah, which is such a standout now, did not have historically high teen marriage levels, the state just hasn’t matched the decline seen nationally. Their premodernism emerged only in relief. Here I again used a prevalence measure. 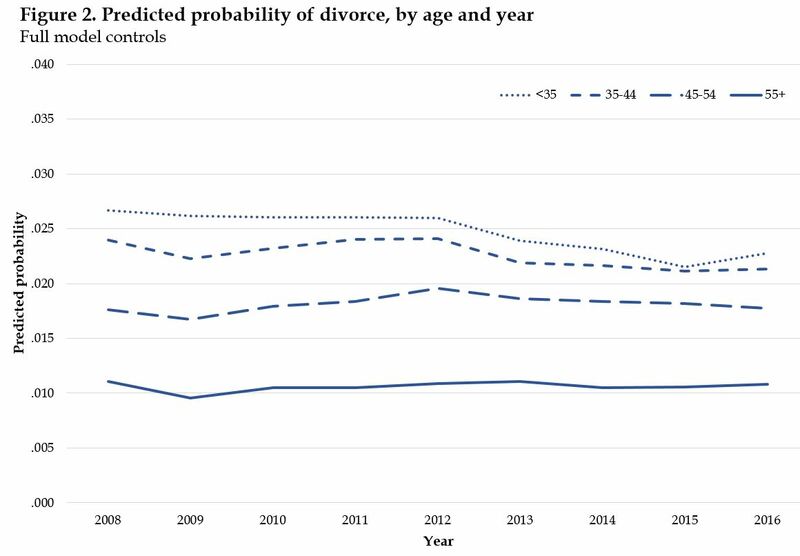 This is just the number of people whose marital status is divorced, divided by the number of married people (including separated and divorced). 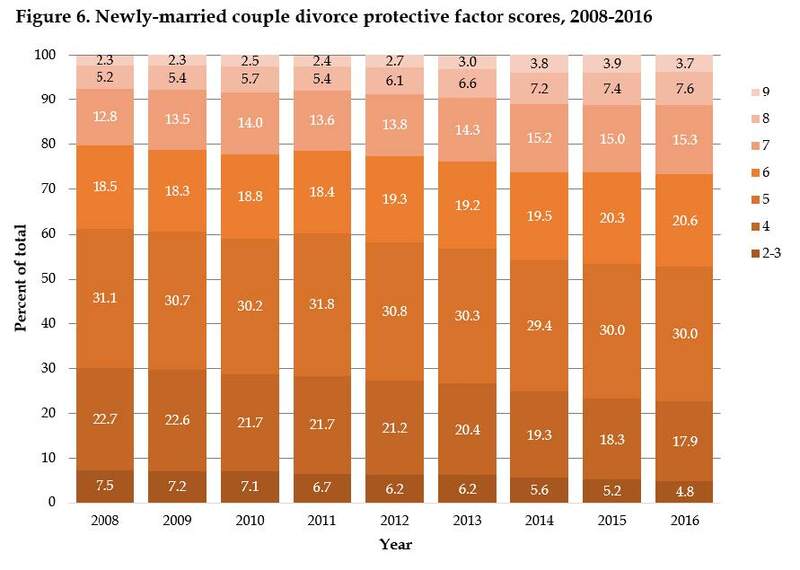 It’s a little better than just the percentage divorced in the population, because it’s at least scaled by marriage prevalence. But it doesn’t count divorces happening, and it doesn’t count people who divorced and then remarried (so it will under-represent divorce to the extent that people remarry). 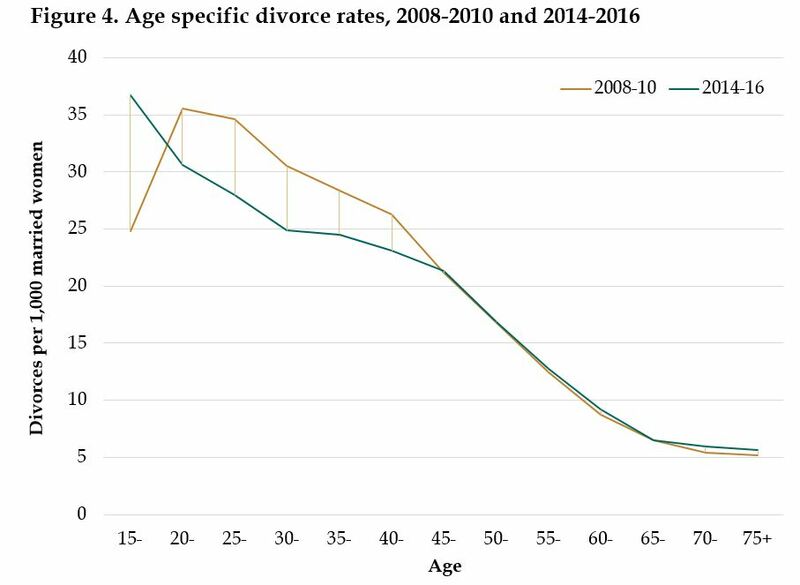 Also, if divorced people die younger than married people, it could be messed up at older ages. 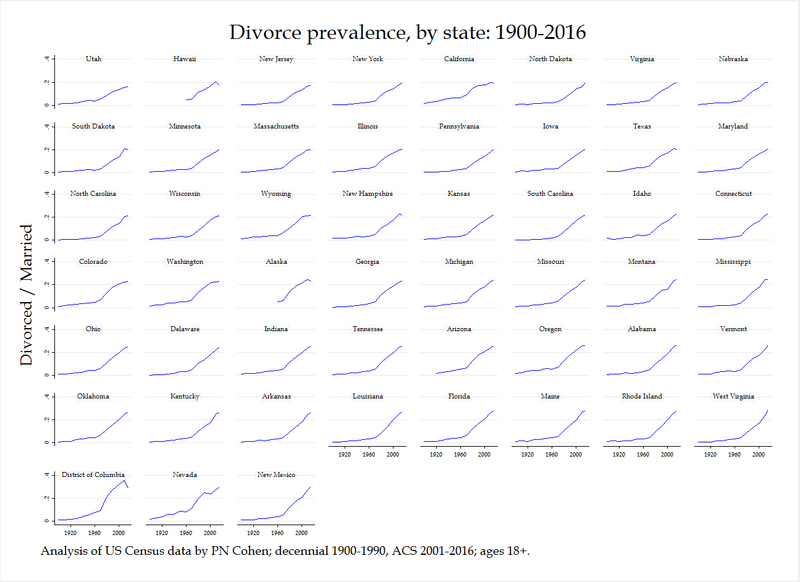 Anyway, it’s the best thing I could think of for divorce rates by state all the way back to 1900. The strategy for both trends is to download microdata samples from all years, then collapse the files down to state averages by decade. 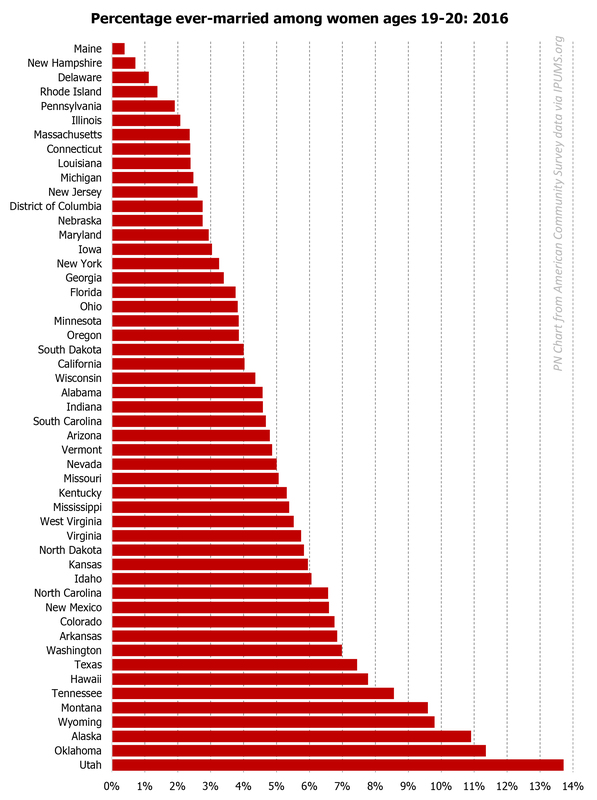 The linear figures are Stata scatter plots by state. The animated maps use maptile in Stata (by Michael Stepner) to make separate image files for each map, which I then imported into Photoshop to make the animations (following this tutorial). The downloaded data, codebooks, Stata code, and images, are all available in an Open Science Framework project here. Feel free to adapt and use. Happy to hear suggestions and alternative techniques in the comments. 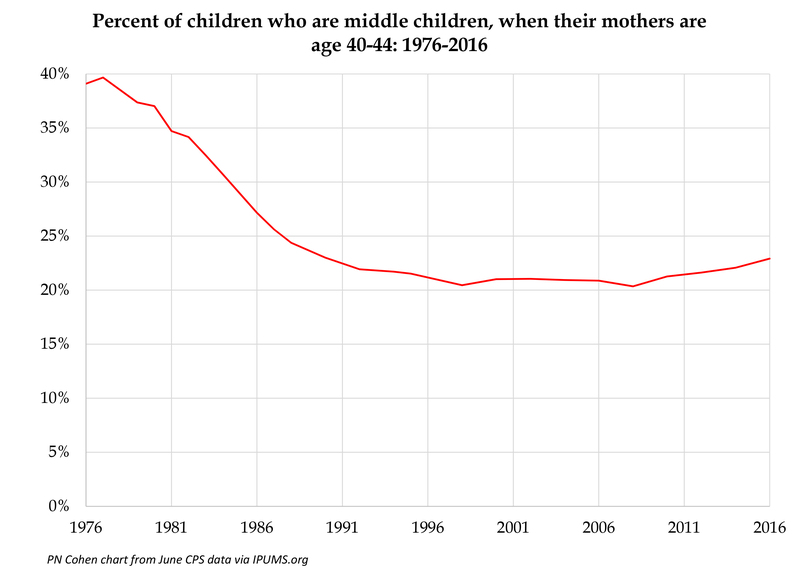 Are middle children going extinct? 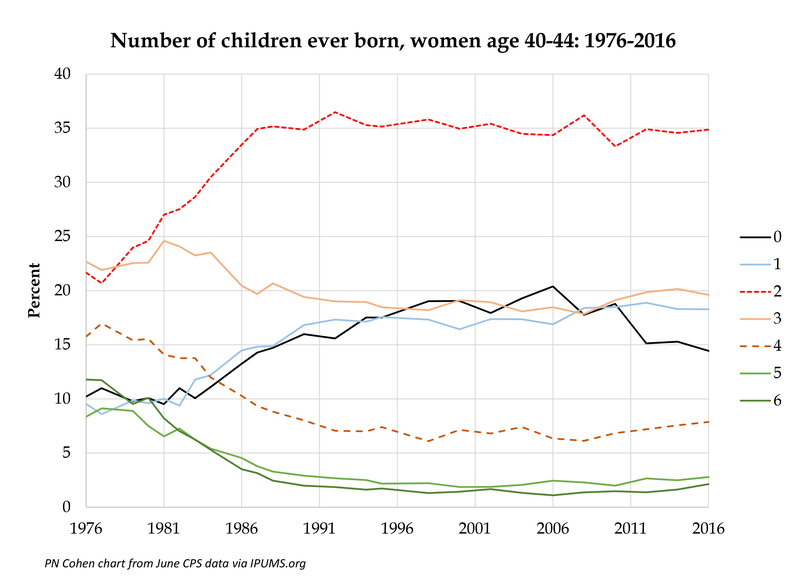 According to a study by the Pew Research Center in 1976, “the average mother at the end of her childbearing years had given birth to more than three children.” Read that again: In the ’70s, four kids (or more) was the most common family unit. Back then, 40 percent of mothers between 40 and 44 had four or more children. Twenty-five percent had three kids; 24 percent had two; and 11 percent had one. Today, those numbers have essentially reversed. 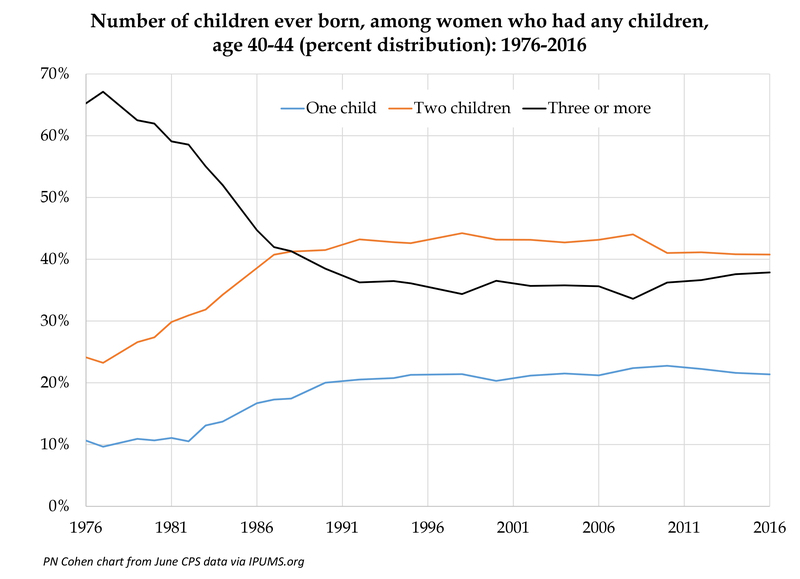 Nearly two-thirds of women with children now have two or one — i.e., an oldest, a youngest, but no middle. 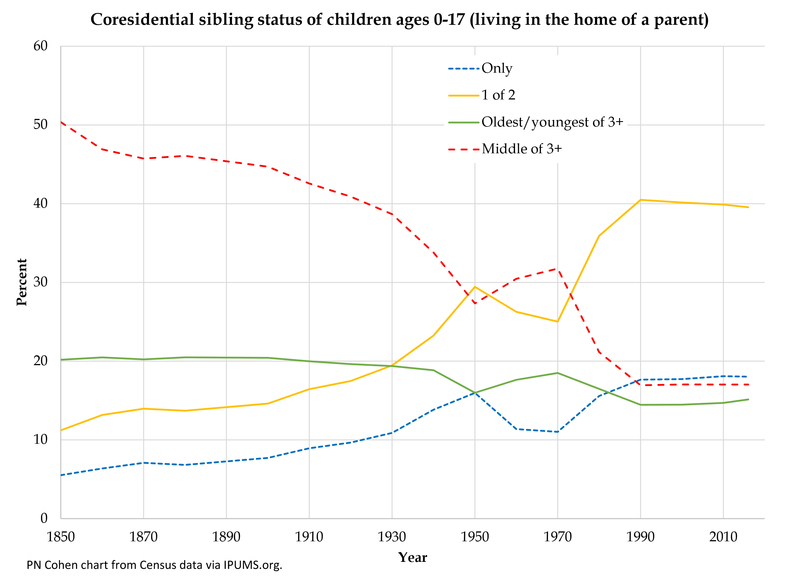 It is true there are a lot fewer U.S. families with more than two children today than there were in 1976. 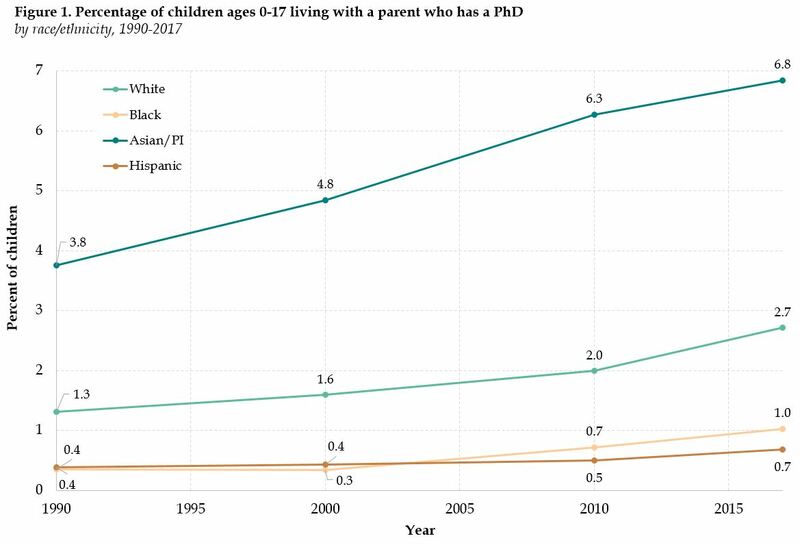 However, by my reckoning (see below), in the most recent data (2016), 38 percent of mothers age 40-44 who have had any children have had three or more. So, there’s a middle child in more than a third of families. And, crucially, that number hasn’t dropped in the last 25 years. I’ll explain. This is what you get for the surveys from 1976 to 2016 (remember these are the years the women reached the end of their childbearing years). So, it looks to me that, for the last 25 years, about 20-25 percent of children have been middle children. Wow! In 1850 half of all U.S. children had an older and a younger sibling in the household with them. Now it’s below 20 percent. Still no drop since 1990, but the long-term change is impressive. So if all that personality stuff is true, then that’s a big difference between the olden days and nowadays. Definitely going to put this in the book.